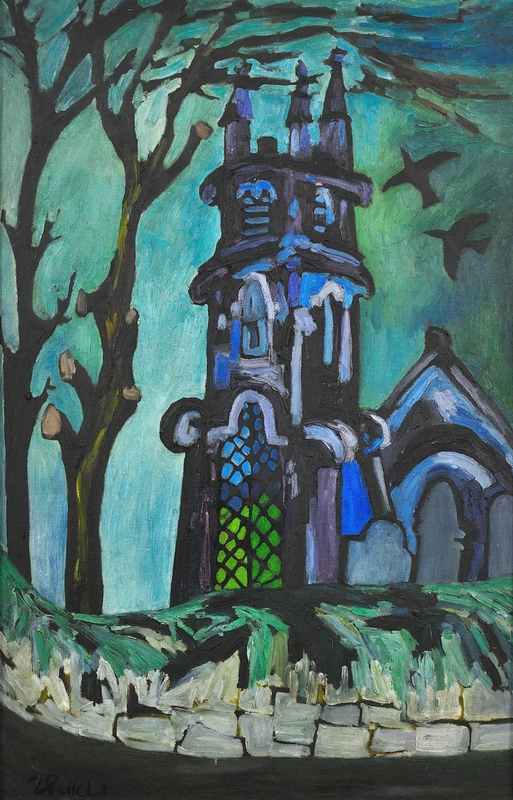 Joan Gillchrest - Church and churchyard - Online gallery supplying original fine art. Trending Modern British and Contemporary Welsh. Available for sale from Big Sky Fine Art; this original oil painting by Joan Gillchrest, dating from around the late 1960s.<br> The painting is presented and supplied undisturbed in its original hand painted frame and mount. (The mount possibly hiding a date beneath the signature). <br> <br> Joan Gillchrest is one of Mousehole’s and Cornwall’s most recognised and celebrated artists. Her vibrant art sits firmly alongside other great artists of the St. Ives School from the 1960s. <br> <br> She was born Joan Scott in London in 1918 into a wealthy and illustrious family. She was the third of four children. Her father was a pioneer of radiology – and a skilful caricaturist - and her Australian mother was an accomplished pianist. Sir George Gilbert Scott was her great grandfather, who designed the imposing Midland Grand Hotel at St. Pancras as well as countless parish churches. Grandfather, George Gilbert Scott Jnr, is remembered for three Cambridge colleges, Christ’s, Pembroke and Peterhouse. Her uncle Giles, (Giles Gilbert Scott) to whom Joan was close, is best known for his magnificent Anglican Liverpool Cathedral, Battersea Power Station and the iconic and ubiquitous red telephone box. Coming from such a long line of eminent architects it is not surprising that Joan always loved architecture and the churches and chapels of the Penwith peninsula feature prominently in her work. She said that buildings were “in her blood”. <br> <br> Her early childhood was spent at the family home in Buckinghamshire, but she was a difficult child – the family hired one nanny for her and one for the other three children- and at one point she was sent to Upper Chine School in the Isle of Wright to give her family some peace! She was however the apple of her father’s eye and he encouraged her obvious artistic talent.<br> <br> In 1934, aged only 15 but encouraged by her parents, she went to Paris to study art and learn the language. There she met Gwen John and studied in various studios, sometimes working as a model. <br> <br> In 1936 she enrolled at the Grosvenor School of Art and subsequently studied there under Iain McNab, whom she described as a marvellous teacher. Her early artistic career was very promising; she first exhibited at the Royal Academy when she was just 18 and showed works at the New England Art Club in 1937 and the London Group in 1938.<br> <br> When the Second World War broke out Joan was 21. She took a crash course in nursing and first aid and volunteered as an ambulance driver for Westminster Hospital. She later drove a mobile rescue unit. She was not able to paint much during the war but kept in touch with McNab; when the area around St Paul’s was blitzed, leaving the cathedral relatively unscathed, McNab got Joan and a few others to paint the scene. Her work, created with a thick paint and a palette knife, hung in the art school for many years.<br> <br> Joan’s painting career stalled in the 1940s. In 1942 she married a barrister and Coldstream Guards officer Samuel Gillchrest, and they soon had a son, then a daughter. With a young family, she had little time to paint, and had to hide the work she did produce as her husband thought that work as an artist was beneath them. Sadly, the marriage broke down and in 1953 they divorced. In leaving a difficult marriage at this time, she forfeited money, security and her previous place in society. <br> <br> Despite the huge changes in her life, her overwhelming desire to paint remained constant. She ignored the disapproval of her friends and family and started to explore new ways of expressing herself on canvas. She moved to a studio in Chelsea, an area much favoured by the artistic community. To support herself, her children and her painting she also found regular work as an artist’s model. She was tall, strikingly good looking and combined elegance with bohemianism. She also carried an air of mystery from her rich and privileged past, and so she became sought after as a fashion model. <br> <br> In the flat below hers lived an artist who had enjoyed some professional acclaim, Adrian Ryan, and he and Joan soon struck up a relationship. Adrian Ryan was a friend of Augustus John’ son Edwin, who had been left his aunt Gwen’s Paris studio. Joan and Adrian thus began mixing in artistic circles, in both London and Paris. Betty John, Edwin’s wife, took herself off to Mousehole and in 1958 Joan and Adrian followed. <br> <br> Joan immediately loved the Cornish coastal location and became part of the charmed circle of artists and itinerant creative people there. For a while Joan lived with Betty John, then sold a sapphire ring and a sable coat she had inherited and bought her own home, a cottage with the most spectacular views of Mousehole harbour and Mount’s Bay.<br> <br> Adrian moved in with Joan, and for a while her cottage this became a family home for the couple and their respective children, when they were not at boarding school. However, Adrian Ryan was a man known more for his charm than his fidelity and their life together could be tempestuous. Moreover, he was not supportive of her artistic endeavours. Intent on consolidating his own status alongside St. Ives figures such as Peter Lanyon and Patrick Heron, Adrian dismissed her painting as ‘gimmicky’ and is reported to have turned her paintings to the wall if he expected important visitors. By 1965 Joan had had enough and she ended the relationship. Liberated from her partner’s disapproval she was at last able to express herself without constraint. Her own artistic style and confidence quickly flourished. She observed “It was only when I threw him out, I could do what I really wanted”. Her cartoonish humour, social narrative and deceptively simple, graphic wit came to the fore. It is said that she became a Cornish Beryl Cook, or Helen Bradley, fusing child-like innocence with highly sophisticated sensibility. Her work celebrates the joy of life, and records the everyday lives of those who holiday, live and work on the coastline with empathy and humour.<br> <br> During this period Joan was encouraged by Jack Wood Palmer, and John Halkes, director of the Newlyn Orion Gallery, and began exhibiting again. Her first solo show in 1969 was at the Plymouth Art Gallery and for the next 20 years she exhibited at most of the Cornish galleries. From 1990 she also had an annual show with the Wren Gallery in Burford, Oxfordshire, and the London’s Design Centre. Since the 1980s Gillchrest’s work has sold from the Wren Gallery in Oxford and on the private market, with prices remaining very strong. A memorial exhibition was held at the Wren Gallery in 2008. <br> <br> Joan Gillchrest was a very private person who never really understood the professional success she enjoyed and was bemused by the demand for her work. She said that she painted in order to give people enjoyment and rarely visited exhibitions, not wanting to be influenced by the work of others. She did not suffer fools gladly, but was warm, loving and generous to those who knew her. She built up a tremendous following and is recognised today as being one in a distinguished line of British naïve expressionists.<br> <br> Joan Gillchrest died on 3rd January 2008, aged 89. One of her legacies to the community of Mousehole is the village Christmas lights. Joan put up the first string of lights outside her home in 1963 and now, every year, the village and its harbour are illuminated, and the event draws large crowds. Her work and her memory lives on. Available for sale from Big Sky Fine Art; this original oil painting by Joan Gillchrest, dating from around the late 1960s. The painting is presented and supplied undisturbed in its original hand painted frame and mount. (The mount possibly hiding a date beneath the signature). Joan Gillchrest is one of Mousehole’s and Cornwall’s most recognised and celebrated artists. Her vibrant art sits firmly alongside other great artists of the St. Ives School from the 1960s. She was born Joan Scott in London in 1918 into a wealthy and illustrious family. She was the third of four children. Her father was a pioneer of radiology – and a skilful caricaturist - and her Australian mother was an accomplished pianist. Sir George Gilbert Scott was her great grandfather, who designed the imposing Midland Grand Hotel at St. Pancras as well as countless parish churches. Grandfather, George Gilbert Scott Jnr, is remembered for three Cambridge colleges, Christ’s, Pembroke and Peterhouse. Her uncle Giles, (Giles Gilbert Scott) to whom Joan was close, is best known for his magnificent Anglican Liverpool Cathedral, Battersea Power Station and the iconic and ubiquitous red telephone box. Coming from such a long line of eminent architects it is not surprising that Joan always loved architecture and the churches and chapels of the Penwith peninsula feature prominently in her work. She said that buildings were “in her blood”. Her early childhood was spent at the family home in Buckinghamshire, but she was a difficult child – the family hired one nanny for her and one for the other three children- and at one point she was sent to Upper Chine School in the Isle of Wright to give her family some peace! She was however the apple of her father’s eye and he encouraged her obvious artistic talent. In 1934, aged only 15 but encouraged by her parents, she went to Paris to study art and learn the language. There she met Gwen John and studied in various studios, sometimes working as a model. In 1936 she enrolled at the Grosvenor School of Art and subsequently studied there under Iain McNab, whom she described as a marvellous teacher. Her early artistic career was very promising; she first exhibited at the Royal Academy when she was just 18 and showed works at the New England Art Club in 1937 and the London Group in 1938. When the Second World War broke out Joan was 21. She took a crash course in nursing and first aid and volunteered as an ambulance driver for Westminster Hospital. She later drove a mobile rescue unit. She was not able to paint much during the war but kept in touch with McNab; when the area around St Paul’s was blitzed, leaving the cathedral relatively unscathed, McNab got Joan and a few others to paint the scene. Her work, created with a thick paint and a palette knife, hung in the art school for many years. Joan’s painting career stalled in the 1940s. In 1942 she married a barrister and Coldstream Guards officer Samuel Gillchrest, and they soon had a son, then a daughter. With a young family, she had little time to paint, and had to hide the work she did produce as her husband thought that work as an artist was beneath them. Sadly, the marriage broke down and in 1953 they divorced. In leaving a difficult marriage at this time, she forfeited money, security and her previous place in society. Despite the huge changes in her life, her overwhelming desire to paint remained constant. She ignored the disapproval of her friends and family and started to explore new ways of expressing herself on canvas. She moved to a studio in Chelsea, an area much favoured by the artistic community. To support herself, her children and her painting she also found regular work as an artist’s model. She was tall, strikingly good looking and combined elegance with bohemianism. She also carried an air of mystery from her rich and privileged past, and so she became sought after as a fashion model. In the flat below hers lived an artist who had enjoyed some professional acclaim, Adrian Ryan, and he and Joan soon struck up a relationship. Adrian Ryan was a friend of Augustus John’ son Edwin, who had been left his aunt Gwen’s Paris studio. Joan and Adrian thus began mixing in artistic circles, in both London and Paris. Betty John, Edwin’s wife, took herself off to Mousehole and in 1958 Joan and Adrian followed. Joan immediately loved the Cornish coastal location and became part of the charmed circle of artists and itinerant creative people there. For a while Joan lived with Betty John, then sold a sapphire ring and a sable coat she had inherited and bought her own home, a cottage with the most spectacular views of Mousehole harbour and Mount’s Bay. Adrian moved in with Joan, and for a while her cottage this became a family home for the couple and their respective children, when they were not at boarding school. However, Adrian Ryan was a man known more for his charm than his fidelity and their life together could be tempestuous. Moreover, he was not supportive of her artistic endeavours. Intent on consolidating his own status alongside St. Ives figures such as Peter Lanyon and Patrick Heron, Adrian dismissed her painting as ‘gimmicky’ and is reported to have turned her paintings to the wall if he expected important visitors. By 1965 Joan had had enough and she ended the relationship. Liberated from her partner’s disapproval she was at last able to express herself without constraint. Her own artistic style and confidence quickly flourished. She observed “It was only when I threw him out, I could do what I really wanted”. Her cartoonish humour, social narrative and deceptively simple, graphic wit came to the fore. It is said that she became a Cornish Beryl Cook, or Helen Bradley, fusing child-like innocence with highly sophisticated sensibility. Her work celebrates the joy of life, and records the everyday lives of those who holiday, live and work on the coastline with empathy and humour. During this period Joan was encouraged by Jack Wood Palmer, and John Halkes, director of the Newlyn Orion Gallery, and began exhibiting again. Her first solo show in 1969 was at the Plymouth Art Gallery and for the next 20 years she exhibited at most of the Cornish galleries. From 1990 she also had an annual show with the Wren Gallery in Burford, Oxfordshire, and the London’s Design Centre. Since the 1980s Gillchrest’s work has sold from the Wren Gallery in Oxford and on the private market, with prices remaining very strong. A memorial exhibition was held at the Wren Gallery in 2008. Joan Gillchrest was a very private person who never really understood the professional success she enjoyed and was bemused by the demand for her work. She said that she painted in order to give people enjoyment and rarely visited exhibitions, not wanting to be influenced by the work of others. She did not suffer fools gladly, but was warm, loving and generous to those who knew her. She built up a tremendous following and is recognised today as being one in a distinguished line of British naïve expressionists. Joan Gillchrest died on 3rd January 2008, aged 89. One of her legacies to the community of Mousehole is the village Christmas lights. Joan put up the first string of lights outside her home in 1963 and now, every year, the village and its harbour are illuminated, and the event draws large crowds. Her work and her memory lives on.